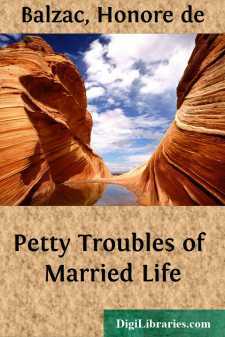 Is it a petty or a profound trouble? I knew not; it is profound for your sons-in-law or daughters-in-law, but exceedingly petty for you. "Petty! You must be joking; why, a child costs terribly dear!" exclaims a ten-times-too-happy husband, at the baptism of his eleventh, called the little last newcomer,—a phrase with which women beguile their families. "What trouble is this?" you ask me. Well! this is, like many petty troubles of married life, a blessing for some one. This phoenix we will call ADOLPHE, whatever may be his position in the world, his age, and the color of his hair. II.—The only daughter of your wife and you. Your wife is to inherit the property of a maternal uncle, a gouty old fellow whom she humors, nurses, caresses, and muffles up; to say nothing of her father's fortune. Caroline has always adored her uncle, —her uncle who trotted her on his knee, her uncle who—her uncle whom—her uncle, in short,—whose property is estimated at two hundred thousand. Further, your wife is well preserved, though her age has been the subject of mature reflection on the part of your son-in-law's grandparents and other ancestors. After many skirmishes between the mothers-in-law, they have at last confided to each other the little secrets peculiar to women of ripe years. "How is it with you, my dear madame?" "I, thank heaven, have passed the period; and you?" "I really hope I have, too!" says your wife. "You can marry Caroline," says Adolphe's mother to your future son-in-law; "Caroline will be the sole heiress of her mother, of her uncle, and her grandfather." You are also the heir of your maternal grandfather, a good old man whose possessions will surely fall to you, for he has grown imbecile, and is therefore incapable of making a will. You are an amiable man, but you have been very dissipated in your youth. Besides, you are fifty-nine years old, and your head is bald, resembling a bare knee in the middle of a gray wig. III.—A dowry of three hundred thousand. IV.—Caroline's only sister, a little dunce of twelve, a sickly child, who bids fair to fill an early grave.